Tomorrow is Thanksgiving which means that today, Wednesday, the day before Thanksgiving is (cue graphics) “The Busiest Travel Day of the Year.” This is the day that many Americans hop on a plane, train, or highway to visit loved ones for the holiday or enjoy a long weekend getaway. A favorite tradition in our household is to watch the Wednesday morning television news broadcast because they invariably send a reporter to an area airport to cover this annual non-story. Usually they send the most junior reporter in what I’m sure is a rite of passage. Occasionally I think more seasoned reporters volunteer for the assignment and show up with their bags packed so they can hop on a plane as soon as the broadcast is done. It’s a free ride to the airport! Our closest airport is Norman Y. Mineta San José International Airport (SJC). We generally don’t fly for Thanksgiving but last month we did get a chance to fly out of the brand new Terminal B Concourse. It started out a little rough because the terminal is a work-in-progress. Check-in and security is still at Terminal A after which we had a hike-and-a-half to get to the Southwest gates at Terminal B. But once we got there I was absolutely delighted. The sweeping ceiling is breathtaking and the curved surfaces and high-key color palette are magical. There are touches which the tech-savvy Silicon Valley traveler will appreciate such as free Wi-Fi and my favorite: cushy Captain Kirk chairs with built-in AC and USB power outlets. A Geek Dad like me could live in a chair like that. 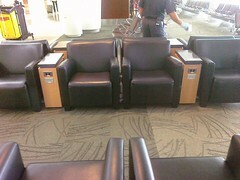 What really put a smile on my face is the concessions in the new terminal. They invited well-known local businesses to operate or at least lend their name to the shops and restaurants so the terminal is a reflection of the region. The restaurants are the San Jose Sharks Cage Sports Bar & Grill, the Britannia Arms British Pub better known as The Brit, and Le Boulanger selling fresh baked breads and sandwiches. The news stand is named for Sunset magazine, longtime champion of the Western lifestyle. For unique snacks and gifts, you can stop by the stylized corrugated fruit stand of Sunnyvale’s own C.J. Olson Cherries. 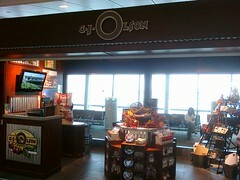 They sell fresh fruit as well as a carry-on-friendly selection of dried fruits and nuts. That’s dried fruits and nuts dipped in chocolate. I couldn’t resist picking up a bag of their mixed pastels. As our flight was early in the morning I opted for breakfast at the Sharks Cage. 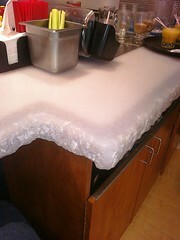 I sat at the bar and immediately laughed out loud when I saw how the top was cleverly crafted to look like ice. Do the bussers carry little tiny Zambonis? I ordered the Hat Trick: eggs (I substituted fruit), applewood-smoked bacon, and home-style potatoes served with three slices of sourdough toast. I’ve had my share of airport breakfasts, but this one was the best as the ingredients were all very high quality. He shoots…he scores! Hooooooooooooooooooooonk! 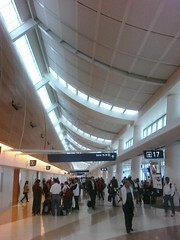 This new terminal is part of an ongoing airport redesign which will result in the removal of the nostalgic but horribly outdated Terminal C. The entire projectthe renovation of Terminal A, construction of Terminal B, and destruction of Terminal Cwill cost $1.8 billion and is scheduled to be complete in Fall 2010. 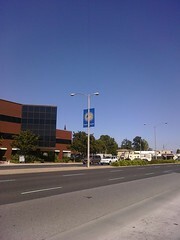 You may be wondering why a blog about El Camino Real, a city street, is covering an airport. This is not a stretch at all. First of all San Jose Airport is really very close to El Camino; the airport’s western boundary, the long-term parking lot, is only a half mile from the Santa Clara Caltrain station on El Camino. Technically it’s walking distance, though it’s pedestrian-unfriendly as you need to cross the Union Pacific and Caltrain train tracks which are very dangerous. Don’t do it, there’s a free shuttle. Second, there’s an interesting historical connection between the San Jose Airport and the Santa Clara Mission, the crucial link in the El Camino Real mission chain: the Mission’s first and second sites were both located adjacent to the airport starting in 1777. The first was on the northern bank of the Guadalupe river near the current-day Trimble exit off U.S. 101. It flooded so they relocated to the second site, 1000 yards south to the current intersection of De La Cruz Blvd and Martin Avenue. 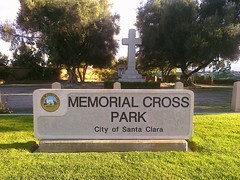 Memorial Cross Park marks the site today with adobe and a cross, just over the fence from the airport employee parking lot. This site also floodedthe mighty Guadalupe was a force to be reckoned withso eventually the soggy padres moved a “musket-shot” away to its final location at present-day Santa Clara University. Third, the astute will note that several of the concessions in the airport’s Terminal B represent businesses on El Camino. C.J. Olson’s of course is on El Camino in Sunnyvale, and the HP Pavilion where the Sharks skate and the Brit’s downtown location are both on Santa Clara Street, El Camino’s historic stretch though the San Jose Pueblo. Le Boulanger is not found directly on El Camino but there are stores just a block or two away. The exception is Sunset magazine which is on Willow Road in Menlo Park; let’s just say it proves the rule. In a sense San Jose Airport’s new Terminal carries the essence of El Camino within it. 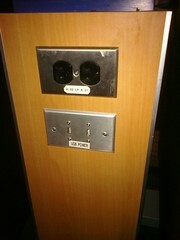 The fourth connection is thematic. El Camino represents the south-north transportation corridor that traverses the state. The corridor started as a footpath, then evolved to incorporate a stagecoach route, railway line, a highway, a freeway, and finally air travel. Looked at this way both San Jose and San Francisco Airports are in the corridor as well as Moffett Field, Palo Alto Airport, and San Carlos Airport, home of Hiller Aviation Museum. So this Thanksgiving, thousands of travelers will make their way to their merry destinations along the El Camino corridor. They may depart from its airports or ride its railway tracks or jam its freeway, U.S. 101. If you join them, heed the common wisdom I learn every year from the Wednesday morning news stories: call ahead or check online for travel conditions, leave early, buckle up (there’s a CHP crackdown [PDF] this year), and be patient. Our family will be enjoying Thanksgiving dinner at my parents’ house a stroll away from El Camino Real in San Mateo. Whatever you do, wherever you go, we wish you a wonderful and safe holiday! Since starting this blog I’ve really enjoyed reading about the early history of El Camino Real, particularly the stories of the Spanish padres and soldiers and the missions they established throughout the state. It’s a very complex history, rife with comedy, tragedy, injustice, and achievement. These men had focus, faith, courage, and unforgivably racist ideals. But the thing that impresses me the most is their stamina. Pure physical stamina. I have no idea how these guys did what they did. The story is often told that the California missions were spaced one hard day’s walk apart. Okay. Google maps tells me that Mission Santa Clara is 45 miles from Mission San Francisco, a fifteen hour walk. Fifteen hours! Even that’s not so bad, as at the end of it you get a nice steaming bowl of posole and a red-tiled roof over your head. Think of the intrepid souls who simply went out trekking through the wilderness, like Don Gaspár de Portolá and Juan Bautista de Anza. Sure they had horses and pack animals, but you know some poor vassals in their parties were on foot. Junípero Serra personally founded missions from Loreto in Baja California to San Francisco in the north before his death at age 70. That’s a lot of ground he covered. Nowadays we may not be called upon to hoof the length of entire counties, but we can pay homage to the padres’ pedestrian prowess with its modern yet ancient analog: the marathon. Well, a marathon is still way too long. How about a nice 10K? 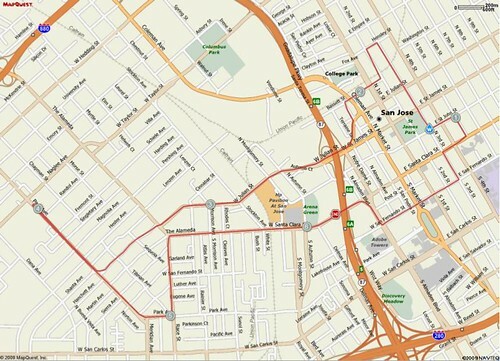 This Thursday, November 26, Thanksgiving Day, the Applied Materials Silicon Valley 2009 Turkey Trot winds its way in and out of downtown San Jose. It’s a 5K run/walk and 10K run (for people, not turkeys) that starts and ends on Santa Clara Street in front of HP Pavilion. Santa Clara Street is of course part of El Camino Real. The 10K course follows a significant stretch of The Alameda as well. The event is in its fifth year and benefits local charities: Santa Clara Family Health Foundation, Housing Trust of Santa Clara County, and Second Harvest Food Bank of Santa Clara and San Mateo Counties. The Title Sponsor is silicon equipment manufacturer Applied Materials; the timing is sadly ironic as they have problems of their own. You can register for the race online or on-site; registration opens at 7:00 AM and the race starts at 8:30 AM. 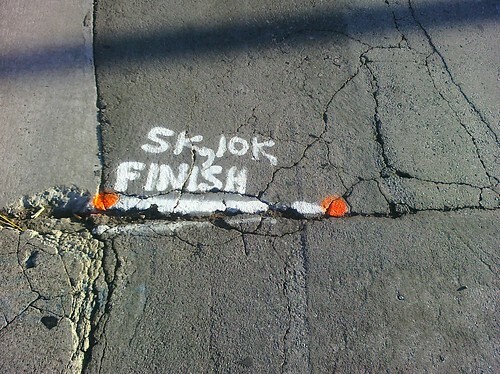 There are additional festivities like a Kid’s Fun Run, a costume contest, and cash prizes for elite runners. The beauty of it is you go, you walk or run, and you burn up some calories so if you celebrate the holiday with a feast afterward you can do so with a clear conscience and you have lively stories to entertain your fellow diners. We’ve come a long way since the Mission days. 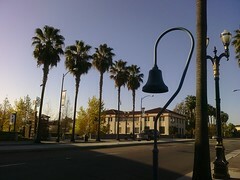 When I find myself on El Camino Real I like to snap a few photos. They’re generally nothing fancy, just a few establishing shots to add to my collection. Usually nothing comes of them but I throw them up on Flickr just to keep them handy. Recently my rainy-day digital packrat habit paid off: Schmap selected one of my photos for inclusion in their online city guide for Sunnyvale! I took this photo after my lunch with Dan at Dusita. I headed up to C.J. Olson’s to load up on produce and decided to photograph the intersection of Mathilda and El Camino while I was there. I guess Schmap found me through the tags and the rest is history in the making. I confess I was unfamiliar with Schmap though I was amused by the self-deprecating name. They publish digital travel guides for cities around the world. This Sunnyvale entry is part of their latest San Jose regional guide. Coincidentally I happen to have met one of the other photo contributors, Ben Combee. I like to say it’s a small valley. This is the second time this year my random photography has been picked up. NowPublic used a couple of my photos in a story about San Jose’s own Joey Chestnut and his record-smashing victory at the 2009 Nathan’s Hot Dog Eating Contest: 68 hot dogs and buns in 10 minutes. My shots are the HP Pavilion jumbotron and the bobblehead. Speaking of Olson’s, their Food and Gift Faire is this weekend. If you stop by, step out to the sidewalk and take in the view that inspired me to capture this kudos-winning photo. Take some yourself. I’d like to see them. Ansel Adams had Yosemite to pursue, interpret, and decipher. Me? I’ve got El Camino. Just before Thanksgiving, our Annual Food & Gift Faire is a great time to visit us and stock up on items for the holidays. Our moist, Dried Blenheim Apricots are especially good in stuffings or as a unique addition to your favorite cranberry sauce. New gifts and special offers await you at this annual event marking the start of the yuletide season. You are currently browsing the All Camino blog archives for November, 2009.